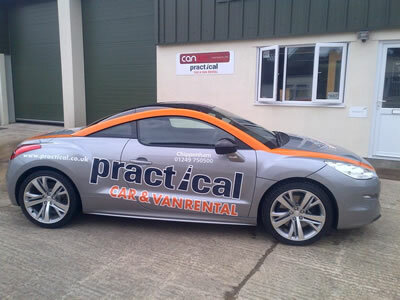 Welcome to Practical Car & Van Rental Chippenham in Wiltshire. We are the official car and van rental location for Chippenham and the surrounding area including Castle Coombe and Melksham. Chippenham have a range of hire cars from small economy to large saloon and estate, with automatic and diesel options too. 7 seater vehicles are also available too. A car rental service is provided to Chippenham Railway and Coach Stations, so train and bus travellers alike can be provided with car hire if required. This service is also offered for tourists and business travellers residing at local guest houses and hotels, including the Angel, Stanton, Pixtons and Hinton amongst others. This enables Chippenham's visitors to conveniently obtain car hire to tour the surrounding area of Wilts. Other services we can provide include a 'meet and greet' option, accommodation of unsocial, bank holidays and weekend rentals - subject to prior arrangement. Chippenham's car hire fleet is offered at highly competitive rental rates and short and long term rental enquiries are welcomed from tourists, residents and the local business community alike. Continental Hire to mainland Europe may also be arranged, additional charges may apply. Chippenham's commercial rental fleet ranges from small car-derived vans and cargos through Short Wheel Base (SWB), Medium Wheel Base (MWB), Long Wheel Base (LWB) and Extra Long (XLWB). Luton Vans with and without tail-lift are available to hire too. Rental enquiries are welcomed from both the local and business community alike for short and long term hire periods, preferrential rental rates may be offered for extended durations. Continental rentals may also be acceptable though extra chrges will apply. Chippenham depot specialises in one way self drive car and van rental too. This facilitates transfers from Chippenham to other destinations or airport terminals throughout mainland United Kingdom (U.K.). Onward travelers can collect their rental vehicle from Chippenham depot and arrange recovery of the hire car from most regional and international airports anywhere in England, Wales or Scotland. This self drive hire facility can also be used for other U.K. destinations that are not necessarily airports such as business addresses, homes or any of our many rental locations situated throughout the country. A range of vans are available too for one way hire from small courier style vans up to the long wheel base (lwb) van. Please go to our ‘one way rental’ page and submit your particular requirements. Practical Car & Van Rental U.K. is the fourth largest rental company in the United Kingdom with over 150 hire locations located throughout the U.K. in England, Scotland, Wales, Northern Ireland and the Irish Republic. Providing Airport Car & Van hire at most major airports including Heathrow, Gatwick, Stansted, Luton, Dublin, Belfast, Liverpool, Aberdeen, Inverness, East Midlands, Exeter, Chelmsford, Cambridge, Southampton, Newcastle, Norwich, Leeds/Bradford, Glasgow and Manchester airports. See our comprehensive drop down list of Airport locations opposite for more detail.